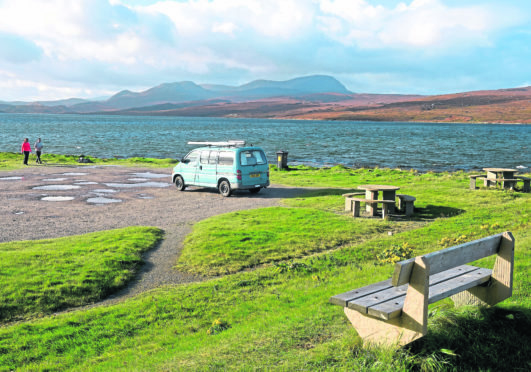 Tourists and their campervan on the Kyle of Tongue with Ben Hope beyond. A new study has revealed the impact a hugely popular tourist trail has had on people living in the north of Scotland – with some even moving away as a result. The North Coast 500 (NC500) was launched by Prince Charles’ North Highland Initiative four years ago to breathe new life into some of the remotest and most economically fragile areas. Since then, it has brought 29,000 more visitors to the Highlands and boosted the economy by £9million according to a study by Highlands and Islands Enterprise. But in new research carried out by Stirling University, the 516-mile route – which begins and ends in Inverness – is not considered all good news. Gary Woodcock, who carried out the study, noted an increase in “antagonistic encounters between residents and tourists” and reported residents were moving away from the area as a direct result of the negative impacts of tourism. He also found regular visitors were also being put off returning to their favourite spots – some of which are reached on single track roads. Mr Woodcock found that it was these sections that caused the most complaints, with commnities complaining about slow-moving convoys of vehicles caused by cars not knowing how to use passing places and caravans and motorbikes. There have also been rows over speeders using the route as a racetrack. For the new study, an online survey was distributed to more than 250 participants, while interviews and observational data was collected during a research trip to the region. The report states: “Findings suggest that most residents hold a negative perception towards the route despite acknowledging that tourism has benefitted their community. “This was particularly clear when certain factors were analysed. Most importantly, location and age were marked indicators with west coast communities and older residents most likely to hold negative perceptions of the NC500. “Furthermore, the study indicates that there have been a series of negative impacts as a result of the NC500. These are mostly defined as ‘disruptions,’ such as an increase in traffic congestion and other driving difficulties. Just 18% of all respondents said the NC500 was positive for the area, while 29% said it was negative. Another 40% reported major improvements were required, such as better infrastructure for roads, toilets and waste disposal and parking. Overall, positive opinions were usually related to the initiative being a boost to the economy, or simply a good idea – with many people born in the area viewing it as positive compared to relative newcomers. The report adds: “It is argued that a negative perception of the route stems from the impacts that are occurring as a result of the sharp increase in tourists visiting the area within a short time. “Furthermore, the lack of reinvestment to meet demand, along with an absence in community consultation throughout the planning process, has exacerbated the impacts leading to a feeling of frustration and, at times, exploitation amongst residents. “Consequently, results showed that there had been an increase in antagonistic encounters between residents and tourists that could have a detrimental impact on the destination’s attractiveness to potential future visitors. A spokesperson for the NC500 said: “As just 250 questionnaires were distributed, it does not offer a representative sample of residents, business owners, private sector employees, public sector employees, day visitors, domestic tourists and international tourists and as such is clearly not properly representative of the views across the NC500 area. “The overwhelming evidence we have points to the contrary. “The North Coast 500 was created to boost the fragile economy in one of the most remote parts of Scotland and as such has been warmly received by people and businesses across the area where it has boosted the economy providing jobs, investment and has had a positive impact on rural depopulation. “Around 400 local businesses now work with us reflecting support for the North Coast project. “In relation to the road policing figures, there is no evidence provided that the individuals involved are visitors or local residents. Nor has any comparison been made with statistics from other areas in Scotland or the UK.